The debate on whether uniforms should be made compulsory has been around for years. 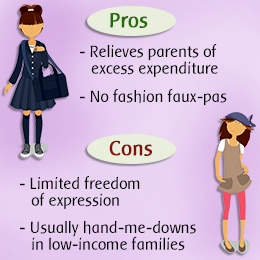 Yet we find conflicting opinions surrounding the pros and cons of having uniforms. Nevertheless, differing perceptions are always welcomed. So let’s see the various arguments made against uniforms and whether they should be made compulsory, by looking into the pros and cons of having uniforms. Given the various arguments and the reasons that support them can help students as well as parents to see reason. Nevertheless, due to differing perspectives the debate on whether uniforms should be made compulsory will continue, as an argument can be made from both sides. But I leave the decision about whether uniforms should be made compulsory to you. I am only here to put forth my perspective about the same. The rest is up to you!